Or at least, the end of summer classes. Today was the last day of System Dynamics and thus, the end of my summer classes. Looking back, I&apos;m glad that I didn&apos;t decide to take three classes over the summer as two was plenty of work. Hopefully between the feedback that&apos;s been given about Systems Engineering as well as the addition of a Software Systems Engineering course option (which I&apos;m planning to audit in the fall), some of the problems present in that class will be less problematic in the future. I know that people have complained quite a bit about ERBA in the past, but seriously, ERBA was a much better class. System Dynamics, on the other hand, really should be a required course for all SDM students. Not necessarily because I think that everyone will use it on a regular basis, but because it provides a very solid foundation on thinking about causes and effects within a system. The exposure has me definitely looking at things with a slightly different light. That said, I think that a lot of the actual modeling is more complicated than you&apos;re going to usually have time to do and a lot of actually simulating the models requires either tons of research to get quantitative data or making up numbers. A cool thing that I learned about yesterday is that one of the GSoC projects is actually working on an activity for the OLPC that lets you do System Dynamics modeling. This is very cool and I actually want to sit down and play with it some in the next week or two. Not having some form of repository to store things and share them really makes collaboration a lot harder. After class, I headed out on this week&apos;s MIT/Harvard ICIC ride. We headed to Jamaica Plain to visit the original JP Licks. 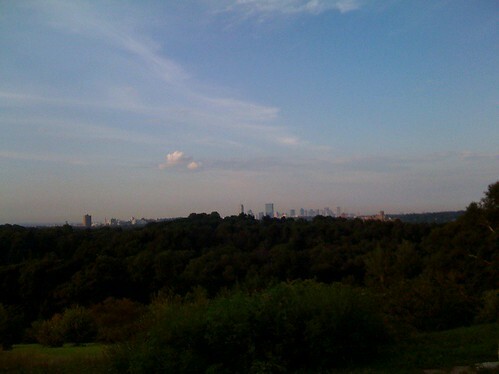 Along the way, took a trip through the Arboretum in JP, and got a nice view of the Boston skyline. Was a nice little ride, although I was regretting not bringing the nice light and the clear lenses as it was getting dark by the time we made it back to Cambridge. But I had them in my bag for the ride home at least. I guess it&apos;s getting to where I&apos;ll be using them more. And I definitely need to go through and replace the batteries in all of my smaller lights as most of them are starting to get a little dim. Just a little bit longer..
Only a few more days and the summer semester will be over. And I have to say that I&apos;ll be pretty glad. Have spent a fair bit of time over the past few days looking at and trying to finish up the presentation my team is giving in Systems Engineering. I need to get back to really spending some time on the System Dynamics assignment. Otherwise, the end of my week was pretty jam-packed with various meetings. It seems to often be that way when I go into the office, but Friday seemed even more so than usual. Then, last night, got home and then went and had dinner with Kara after which we spent some time just wandering and looking at books in Barnes and Noble. This morning, I woke up and headed out on the Quad Ride. I tried to take it sort of easy since I&apos;m planning to race tomorrow and succeeded better than I usually do. Only did about 40 miles. Felt good to have a day that wasn&apos;t just pouring rain, though, especially after the past few days. And the sun even came out for a bit! Tonight, I&apos;m going to spend a little bit more time on System Dynamics and then I think Kara and I are going to watch Harold and Kumar 2 as something light and fun. Tomorrow, I&apos;m headed to Wells Ave to ride in circles for a little bit. Should be a good time. So yeah, last week kind of flew past me and I didn&apos;t do a good job of keeping up with posting. Lots of it was building live images for the Fedora 10 alpha (coming to a mirror near you tomorrow), testing said images, building new images, and doing over and over again. Also a whole ton of mail on various fronts. Today was more of the same, although also a lot of time trying to track down what was going on in a weird livecd-creator bug that has been popping up from time to time forever. Finally figured out the root cause so hopefully we&apos;ll get to the bottom of it real soon now. On the school side, it was the usual level of madness for summer classes. Spent a good chunk of time Tuesday after class finishing up the System Dynamics assignment and then home to work and have dinner. Only a tiny bit longer of that and then I get a few weeks off before fall classes begin. And Kara and I have booked a short trip for in that time period as we have some overlap this time around. And then to keep things even more busy last week, we had a pretty busy social schedule. Wednesday had a group of the Quad racers getting together at Redbones and so I wandered down there as, hey, why miss a good chance of eating at Redbones. Thursday was then the monthly “Cafe Quad” social, although I really only briefly popped my head in before going home due to the tiring week. Friday night, Kara and I ended up going out with Kate and Jon to drink to a better August, as Kate&apos;s July kind of sucked. Saturday was probably the slowest day — Quad ride in the morning, spending a little bit of time between work and looking at school stuff in the afternoon, and then dinner and watching Walk Hard: The Dewey Cox Story which was no better or worse than I expected it to be. It was just the sort of light comedy that I was needing at that point. And I think that mostly catches up to the present… this week might be a little bit less insane on some fronts, but I&apos;m sure it will make up for it on others. Last Tuesday in System Dynamics (yeah, I&apos;m behind on my blogging… it happens sometimes), we had a guest lecture given by Jay Forrester. Jay, aged 90, founded the field of System Dynamics as a professor at MIT about 50 years ago. So it was pretty cool (IMHO) to get to see him speak in the small environment that our class provides. The first portion of the talk he gave covered some of the work he did a little over thirty years ago looking at the dynamics behind world growth. This includes things like population, economics, sustainability, pollution, etc. The interesting and somewhat scary thing is how much the growth of the past thirty years has matched what the predictions based on the models were. Especially as one of the big messages of the model was that continued and unfettered growth is completely and entirely unsustainable. One figure that sticks out in my mind even a week later was that if population growth continues on its current trajectory then at some point (I forget the time horizon sadly), we end up needing to expand into space at a constant speed of a quarter of the speed of light to continue to fit 1 person/1 sq ft of land. The solution that he and the Club of Rome (whom he was working with) were recommending as a path was to actually make changes to help curtail growth in a natural fashion rather than having it occur as the system corrects itself, leading to a downturn in many different quantities which all directly relate to quality of life. If you want more details on this, take a look at the books World Dynamics and Limits of Growth. Or, we&apos;re continuing to build out the models in class, so I may actually do another post on that later this week. The second part of his talk was on something that he&apos;s been working on more recently which is working towards the teaching of system dynamics thinking in K-12 education. This was pretty interesting too and raises some good points — I can easily see how it&apos;d be easier to learn some of the dynamics way of thinking before you have as many preconceived notions that have been drilled into your head by other education. Also, one of my classmates raised the great point of how his kids love playing SimCity and games like that which are all about system dynamics modeling. Anyway, was a great experience and I really enjoyed watching him speak. If you have the opportunity and have the least bit of interest in such subjects, it&apos;d be worth making the effort to see it as well. At this point, our System Dynamics class is down to about 20 people in the classroom and 5-ish distance students I think. There were a couple originally in the course that have dropped it due to work load and a lot of the “usual suspects” that would be taking it who are full-time students are doing internships this summer. This semester&apos;s business trip seems to have a better turn out than the one from the spring. It&apos;s been good to see the distance folks again but given the classes I chose to take and people doing internships, there are a lot of people around I haven&apos;t seen much of. Last night was then dinner at the Summer Shack. Was good to go around and talk with folks and also got to catch up with Alyson a bit on her new job. And ended up having a couple of conversations with people about the iPhone. Unfortunately due to class, Kara couldn&apos;t make it. Today was a light day with lunch and then nothing really until dinner time. For that we had a mixer with the LFMs which was good. And for a change we managed to go through the entire budget for the event. Tomorrow is class in the morning and then the SDM town hall. Then i&apos;ll hopefully get some good work done before heading to the alumni event which Yoav helped to put together. And then on tap for the weekend – rest. Between Seacoast over the weekend and this week, I&apos;m looking forward to it. Another busy day today. Started out with Systems Engineering in the morning and Professor Dan Frey talking about the Design of Experiments. Another session where I can easily see where in a physical engineering field, it would have a lot of relevance and could be easily applied. Software, still, not so much. Maybe if you&apos;re doing human factors/user interface you could take advantage of some pieces of it but I&apos;m not entirely convinced. And if you&apos;re doing things at a lower-level, then almost certainly not. When you&apos;re designing a software system at that level, you don&apos;t really have knobs and levers to adjust and then see how they change some sort of outcome — instead, your design is focused on functional requirements and just meeting those requirements. And then adjusting as the requirements inevitably change. Later in the day, I had my final-for-now FESCo meeting. As some may have noticed, I have decided not to run for FESCo this time around. There are a variety of reasons why this is the case and it&apos;s really not worth going into all of them. One thing that will be nice will be having one less meeting a week to need to attend. Although I&apos;ll probably still chime in frequently enough from the cheap seats. After that, it was off for a trip to the dentist. Biked there, got there right on time and then got to wait half an hour for the dentist. *sigh* Eventually got things taken care of and was on my way, if a bit later than I had intended. Then, this evening, we had another SDM Connect event. I tried to organize it more in the fashion that Alyson had started things off in last year — very informal and low-key. And so I asked the inimitable Yoav Shapira to come and talk about his startup/entrepreneur experience and what helped (and didn&apos;t help) from his time at SDM. As usual, he gave lots of good information and insight and it was good to see him again. Everyone seemed to enjoy it and I think that the format kind of “clicked” with people to some extent. Or so I&apos;m hoping. A few people had some ideas about future speakers and I told them to let me know and hopefully we can get SDM Connect to happen again on a more regular basis. Then, home and now it&apos;s time to head to bed. Tomorrow, I&apos;m getting FIOS installed… hopefully they&apos;ve figured out cable cards (as I&apos;m still quite happy with the Series3 Tivo) by this point and it&apos;ll be painless. But, I&apos;m going into it expecting basically the worst given that it&apos;s a telecom company. We&apos;ll see how it goes. System dynamics continues to be a great class. I can actually see myself using it some to try to justify my intuition on what the outcome of changes will be and then maybe have more effective arguments against (or for) various things. Also the Beer Game was a lot of fun last week. To be fair, some of it is supply chain-y, but that just seems like it&apos;s because it&apos;s the easy examples, not because of any inherent flaw in the modeling approach. Kara&apos;s sister&apos;s wedding was on Saturday so we went down for that. Was nice although I was tired by the end of the evening. Then on Sunday, Kara and I stood in line for iPhones. Line wasn&apos;t too bad but we then had extra time due to the first phone they opened for me had a bad screen. And they were good about just taking care of right away, no questions asked. Yes, by getting an iPhone, I&apos;m somewhat of a sellout. But it&apos;s a pretty nice phone. Although i&apos;ve crashed Safari a couple of times. But having a web browser that&apos;s actually sane for, say, browsing the web is good and HSDPA is the upgrade I had hoped over edge. And realistically, it&apos;s not like the Blackberry is more open, or Symbian (although it may someday be) and Android is a farce of openness at present. I&apos;ll save my Android rant for another day, though. Err, I had more to say, but I&apos;ve forgotten it now. Suffice it to say that I&apos;m sure it was interesting and would have been incredibly enlightening. Unlike many Sundays, today was actually pretty productive. I woke up this morning with the intention of getting in a good ride and I succeeded in doing so. I met up with the Quad crowd down at the shop and went out for a good, relatively high intensity ride. Kept it on the shorter side (45-ish miles), though given all of the other things that were on my plate for the day. After the ride, I picked up some Cytomax quickly at the shop and then headed home. Took a quick shower and then popped over next door for the birthday party for our neighbor&apos;s one year old. Talked with people and then bowed out so that I could spend some time working on getting the homework that had piled up done. This was where I expected to need to spend a lot more time today and really, I&apos;m pretty happy with what the time requirement actually ended up being. The biggest problem with the System Dynamics homework was getting VenSim working. Unfortunately, wine seems to not want to work for some reason now and thus I had to fall back to doing a full machine emulation of Windows 98 (I knew I kept that CD around for something :-). But kvm running Windows 98 seems to hit some bad code paths, so eventually, I ended up using just bare qemu. Which mostly worked, although I still had to deal with a litany of Windows being stupid. But eventually I got things up and running enough that I could install VenSim and do the homework set. Seemed pretty straight-forward and I think that thus far, I “get” what we&apos;ve covered in the class. The Systems Engineering homework I had started on some over the past couple of days in short little spurts just gathering my thoughts for the questions. So it was only a small matter of putting everything together to finish that up.